"Rise of the Hollow Men" - Part One: "Into The Broken Silo"
The Phantom Stranger has been waiting hundreds of years to begin his plan and even he is surprised Conner is a pivotal part of his destiny. Morphing into a flock of crows, Stranger follows Conner as he races around Smallville. At that same moment Sujan is contacted by a woman in the future. Her hologram demands that Psionic Lad not waver from his mission to kill the Prime Hunter. The problem is that Sujan is beginning to like Simon and Conner and is hoping he can alter history without killing one of them. The hologram dissipates as the Kent Farm livestock begins to feel agitated. As Sujan investigates he sees the flock of crows and tries to probe their minds. Stranger reacts angrily to this revealing he knows all about Psionic Lad and his plans but that he wouldn't interfere in today's predestined series of events. Elsewhere Simon is re-evaluating his future and his working on some of his neglected experiments. This one, a weather machine is all ready to activate when he too is taken by surprised by the flock of crows, almost beckoning Valentine to follow. Superboy and Krypto are flying above Main Street, when Krypto spots a familiar face and diverts to meet him. Conner follows and realizes it's Mr. Lynch who predicted Parasite's arrival in Smallville a while ago. 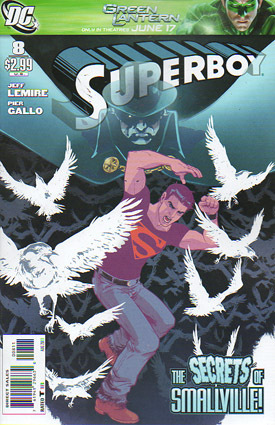 Lynch alludes to the fact he is aware of Superboy's civilian identity and while the trio sit outside the diner, Lynch tells Conner about Smallville's beginnings and the story of Sheriff Nathaniel Kent, Deputy Albert Valentine and the mysterious Took family. In the 1800s the Took family arrived in Kansas after Eben Took fled England for practicing arcane and experimental extreme exploratory surgery. The Tooks terrorized the good Smallville folk angering Nate and making the Tooks and the Kents mortal enemies. Their feuding went on for years until the sad day that a young boy named Jacob Talbot was abducted and thirteen days later found mutilated with surgical precision and sporting mystical rune symbols. It was obvious to Kent, Valentine and the townsfolk at large that the Tooks were to blame and set about burning their farm to the ground. While Tooks' family died in the blaze Kent explored the old Silo and found a trapdoor. Beneath the door Nate discovered human remains on a large rune table and Eben Took. Nate ran as the blaze enveloped even the silo and barely made it to safety before the silo exploded. Story over, Conner realizes Lynch had been quietly guiding him to the secrets of the broken silo. However before he could check on the story further. Lynch begins to glow and is possessed by Phantom Stranger who offers yet more cryptic riddles and vanishes. Simon arrives after chasing down the parts that the crows had stolen from him and they are puzzled as to why they did so. Sujan arrives too revealing a spell of some kind has frozen Smallville's residents but that due to his powers, he was able to insulate Simon & Conner from its effects. They finally have a lead though, the 'Took Family' and so using his trusty web tablet Simon is able to search land registry to find the modern day location of the evil farm. Where would it be? Luthor land of course! It's too little, too late as Lori discovers the same old trapdoor that Nate had found years ago. In a flash of light, she's gone. Psionic Lad, Simon, Conner and Krypto arrive literally seconds later and are joined by Phantom Stranger, in physical form. With his additional skills in magic, Simon's expertise in science and Sujan's Psionic abilities they uncover a deep spiral tunnel descending deep into the earth. Conner's x-ray vision can't help as whoever or whatever was down there has had lead sheeting placed strategically to prevent Conner, Kara, Karen and Eradicator from finding them. Phantom Stranger gives Lori's kidnappers a name; The Hollow Men and leads them down to a strange underground town but it's nothing like Smallville, in fact it is obviously evil. Story - 4: An expertly weaved story that, save issue #6, has been slowly building in momentum. Considering what a fantastic story this is I'm saddened it has arrived so quickly. I love the backstory weaving the Kent & Valentine bloodlines together, along with the pure evil of the Tooks. It gives the fact that Simon and Conner are friends a sort of destiny feel that made it feel natural. Also could the fact that the Tooks are truly pure evil and had scattered talismans of evil that were influential in science and magic somehow have effected the Luthors when they moved onto the land? Perhaps somehow they were the unknown element that made Lex into who he is today? To make a reader ask these questions and question even Superman's history... That is the mark of excellent writing. There is so much going on and so many threads running throughout but it never seems like any of it is forced. Art - 4: The aggressive style of the Doomsday story is gone and we return to our regularly scheduled programming. Don't think I didn't notice the Parasite frogs! I hate westerns but Smallville's first citizens and the feud with the Tooks is beautifully rendered. Cover Art - 3: The covers have been of a consistently high quality since the series began. I am usually a big fan of Kerschl's work, however this artistic and symbolic piece didn't take full advantage of the story's strengths as it could have. It's with great reluctance that I have to give it such a rating. Perhaps it's because of the fantastic story that I feel it needed as strong a cover to match its interior.